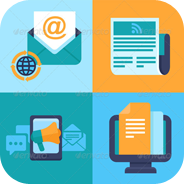 Email Marketing To Clients/Customers – The Objective behind email marketing is to create a continuous stream of the right prospects who understand the value and expertise of your business and are interested in working with you. There are actually three steps to Email marketing – creating the editorial calendar, creating content for your blog and designing the message to extend your brand. Editorial Calendar. First, we develop an editorial calendar based on 12 months of information. The content strategy is based around the information you can provide your clients and the key messages you want them to remember. Ninety (90%) of your email marketing content should be educational/informational. Only 10% should be promotional/internet marketing. Creating a calendar of content is a good way to ensure that there is always information to include in your email message and it is the best way to keep your marketing efforts consistent. To create the calendar, we will look at how your service is affected by the seasons and months of the year and plan accordingly. If there are any conventions, meetings or conferences that you will be attending, we should note those dates and make sure we promote them in a timely manner. Any other services that are affected throughout the calendar should be considered – for example, services that are affected during budgeting times, vacations and weather conditions. The content outlined in your editorial calendar should also be considered for other marketing that you may initiate throughout the year. For example, if your distribute letters to clients or prospects, consider using the same content as outlined in the calendar. And if you are active in social media, your posts should also match your email messages both in topic and time frame. If you have the need for press releases – such as when new products or services are implemented, these should also be included on the calendar. Blog and Social Media Strategy. Paying particular attention to the editorial calendar, we will create articles (of 500 words or less) for your blog that would be promoted on your website and possibly on your various social media sites. Email Marketing. Once the first articles are on your blog, we use this content to develop a more consistent, more personal email newsletter to your clients and prospects. This newsletter would be designed with your brand and be distributed to clients, prospects and networking contacts. Because the content comes from your blog – you are essentially “pushing” the information to prospects, resulting in more people reading your information and visiting your website. Email marketing is the most economical and productive solution to sustaining contact with your prospects, clients and former clients – keeping them informed of your public presence, your skills, philosophies and the solutions you offer. The purpose behind email marketing is two-fold: 1) to consistently touch your prospects and clients so that when they need your services, they think of you; and 2) to deliver expert content to enhance your relationship and bring more clients in your door. Articles for your email newsletter will focus on your services and how you help your clients. Your articles could include a few tips and information about your particular expertise. These articles are not in-depth, step-by-step how-to articles but rather simple tips that remind your prospects and clients of your expertise. You aren’t “giving away the farm,” but rather demonstrating your knowledge and experience. Your potential clients get to know you. They begin to understand the qualities and advantages of your services. And by developing a relationship with your readers, your pre-sale work is already done. Prospective clients are more likely to call you when your services are needed. And present clients are more likely to call you back, to ask for additional services. Your email newsletter begins with a custom designed newsletter, branded with your company name and colors. The content would be based on the articles we would write and/or edit (and you would approve) for your blog. Through these messages, your expertise is evident, your message is personal. The emails would be sent via our third party email marketing vendor, which allows the prospect or client to unsubscribe. (If you already have an account in an email marketing program, we can also create these messages within your own account). The CAN-SPAM Act makes it mandatory for companies to allow clients to unsubscribe. Used in conjunction with the lists of clients and prospects you have now and add later, email marketing can jump start your marketing efforts and keep a continuous flow of clients in the funnel. Distribute monthly. We recommend that you choose a date/day each month when the email should be distributed. Keeping a consistent schedule is more effective and your clients and prospects start to recognize when they will receive more information from you. We recommend Tuesday, Wednesday or Thursday during any week. Analytics. We will monitor your open and click-through rate and track the effectiveness of your email marketing. By taking the readers to articles posted on your blog, we will discover which topics are of most interest to your readers as we track their movements. You will begin to see trends and we will be able to write additional content on areas of interest. We will also provide information on unsubscribed contacts, bounce back info and forwarding info. These statistics will be provided to you shortly after each e-newsletter distribution. Email marketing is the most effective and least costly method of marketing to your clients, former clients and prospects on a consistent basis.